The new generation Porsche 911 Carrera is emerging from one of the biggest development steps in the long history of this classic sports car. Almost 90 per cent of all components have been redesigned or redeveloped. With its all-new lightweight body, further drivetrain efficiencies and new suspension systems, the Coupé offers the driver improved Porsche Intelligent Performance. This manifests itself in yet further enhanced driving dynamics, up to 16 per cent lower fuel consumption and emissions combined with even greater everyday practicality. 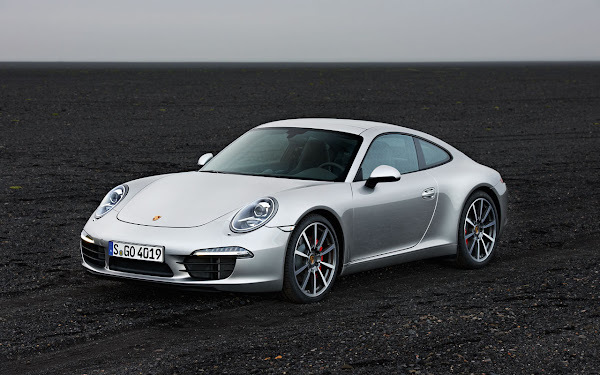 911 Carrera: 350 hp (257kW) 3.4-litre boxer engine; rear-wheel drive, seven-speed manual transmission, optional seven-speed Porsche-Doppelkupplungsgetriebe (PDK); acceleration 0 – 100 km/h (0-62 mph) in 4.8 seconds, with PDK in 4.6 seconds (4.4 seconds with Sport Chrono Package); top speed 289 km/h (179.6 mph), with PDK 287 km/h (178.3 mph); fuel consumption (NEDC) 9.0 l/100 km, CO2 212 g/km; with PDK 8.2 l/100 km; CO2 194 g/km. 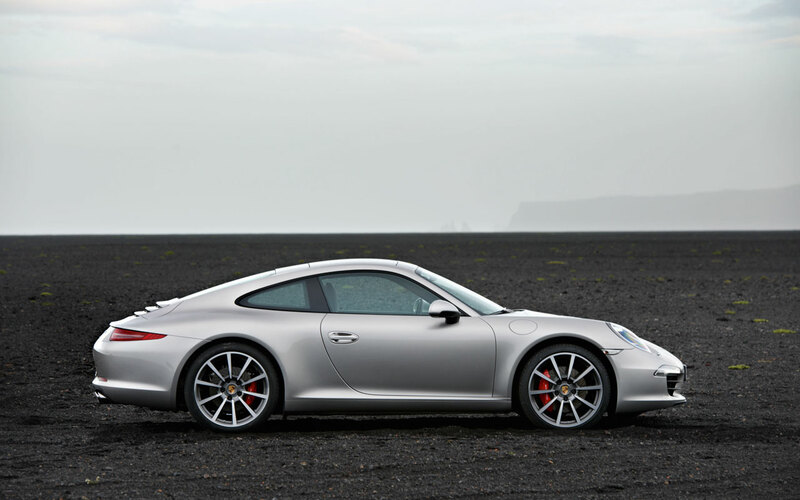 911 Carrera S: 400 hp (294 kW) 3.8-litre boxer engine; rear-wheel drive, seven-speed manual transmission, optional seven-speed Porsche-Doppelkupplungsgetriebe (PDK); acceleration 0 – 100 km/h (0-62 mph) in 4.5 seconds, with PDK in 4.3 seconds (4.1 seconds with Sport Chrono Package); top speed 304 km/h (188.9 mph), with PDK 302 km/h (187.7mph); fuel consumption (NEDC) 9.5 l/100 km; CO2 224 g/km; with PDK 8.7 l/100 km; CO2 205 g/km. 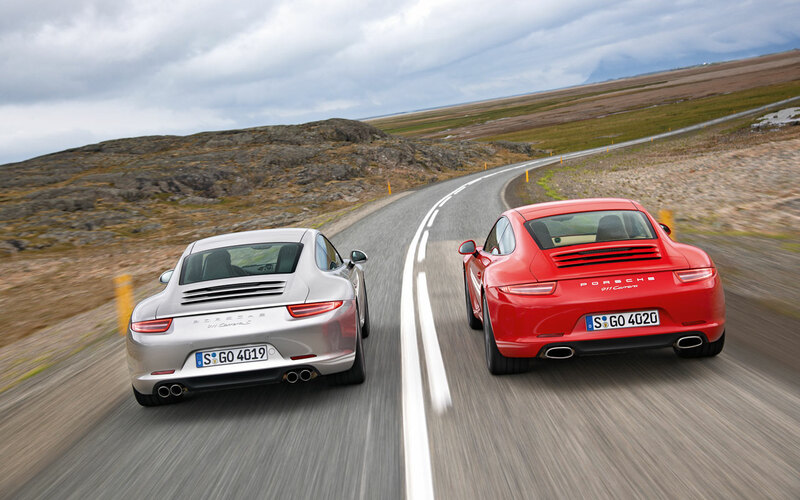 The 911 Carrera's design and proportions have developed in step with the technology. One of the most pronounced points of differentiation is the 100 millimetre (3.94 inch) longer wheelbase.The body on the other hand is only 56 millimetres (2.20 inch) longer overall lengthwise, the overhangs being shortened by 32 millimetres (1.26 inch) at the front and twelve millimetres (0.47 inch) at the rear. The Carrera’s roof line is around seven millimetres lower than that of its predecessor and around six millimetres for the Carrera S. The maximum headroom remains virtually unchanged. For Coupés with a sunroof, which for the first time is of the electric slide/tilt type, headroom has even increased by 15 millimetres. With an overall length of just under 4.5 metres (176.81 inch) and a maximum width of approximately 1.8 metres (71.18 inch) the 911Carrera remains the most compact sports car in its class.